We’ve all heard about ransomware and know that it is a type of malware that prevents you from accessing your data until you pay a ransom. 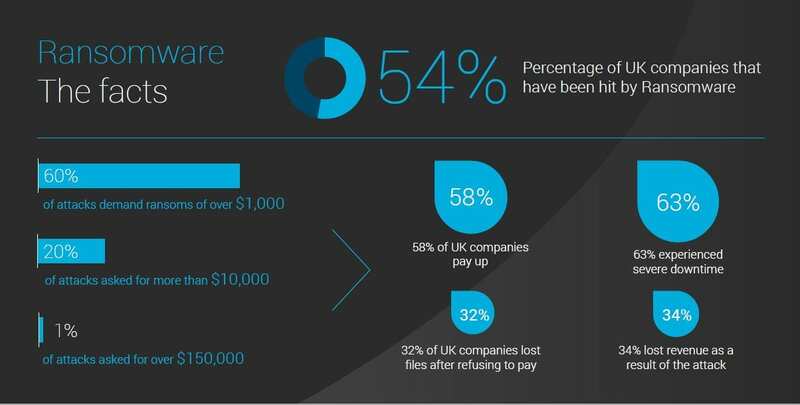 However, did you know that only 4% of organisations say they are confident of their ability to protect themselves against Ransomware attacks. By deduction this then leave 96% that are not so confident! The number of ransomware attacks have been growing at a steady pace since 2015. In 2016 the actual occurrence of such attacks almost doubled, showing a 172% increase in the first half of 2016 compared to the whole of 2015! This growth is said to have been fuelled by the rise of “Ransomware as a service” which is a type of ransomware designed to be used by anyone with little or no technical knowledge. These agents simply download the virus either for free or for a nominal fee, then they set a ransom and payment deadline. Following this their aim is to trick Users into infecting his or her computer, and should the victim pay up the original author receives approx. 5% – 20% and the rest goes to the ‘script kiddie’ who deployed the attack. Scary really isn’t it? Considering the amount of income this can generate, it’s safe to say that this will not go away anytime soon. For the safety and health of your business, you need to be aware of the risk and take appropriate steps. Invest in training for staff so that they are aware of how ransomware works (including Phishing). Establish security practices and policies for employees. Install latest software updates to protect against the latest online threats. Carry out inside-out and outside-in penetration testing. In spite of all the preventative measures you make take, you really do need to plan for the possibility that you will get hit. A Disaster Recovery Plan is your last line of defence.